The Fire infomation below is calculated using recent weather data observations and offer an overview of the fire weather conditions for Colton, Oregon and surrounding area. The Initial Spread Index (ISI) indicates the rate fire will spread in its early stages. It is calculated from the FFMC rating and the wind factor. The open-ended ISI scale starts at zero and a rating of 10 indicates high rate of spread shortly after ignition. A rating of 19 or more indicates extremely rapid rate of spread. The Build Up Index (BUI) shows the amount of fuel available for combustion, indicating how the fire will develop after initial spread. It is calculated from the Duff Moisture Code and the Drought Code. The BUI scale starts at zero and is open-ended. A rating above 34 is high, above 77 is extreme. The Fire Weather Index (FWI) is based on weather readings taken at noon standard time and rates fire danger at the mid afternoon peak from 2:00 - 4:00 pm. 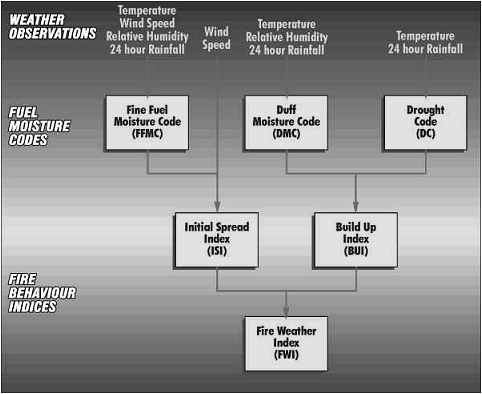 To interpret the system, the three fuel moisture codes and the three behaviour indices need to be understood. Each code and index is a numerical rating related to likely fire behavior. The scales start at zero, and except for the Fine Fuel Moisture Code which has a maximum of 99, all are open-ended. Low ratings indicate high moisture content, and ratings rise as moisture content decreases. Ratings rise as fire weather becomes more severe. The Fine Fuel Moisture Code (FFMC) is a numerical rating of the moisture content of surface litter and other cured fine fuels. It shows the relative ease of ignition and flammability of fine fuels. The moisture content of fine fuels is very sensitive to the weather. Even a day of rain, or of fine and windy weather, will significantly affect the FFMC rating. The system uses a time lag of two-thirds of a day to accurately measure the moisture content in fine fuels. The FFMC rating is on a scale of 0 to 99. Any figure above 70 is high, and above 90 is extreme. Analogous in concept to the National Fire Danger Rating System (NFDRS), the Fire Weather Index System depends solely on weather readings. Overview and structure below. The Forest Fire Danger Code (FFDC) is based on predicted generated "fire intensity (kw/m²)" in grass type vegetation (dry grass, tussock). This code denotes how difficult it would be to control a fire in this vegetation type should one start. The Byram-Keetch Drought Index (BKDI) attempts to measure the amount of precipitation necessary to return the soil to full field capacity. It is a closed system ranging from 0 to 203 units (0 - 800 imperial) and represents a moisture regime from 0 to 203 millimetres (0 - 8 inches) of water through the soil layer. At 203 millimetres (8in) of water, the KBDI assumes saturation. Zero is the point of no moisture deficiency and 203 (800) is the maximum drought that is possible. At any point along the scale, the index number indicates the amount of net rainfall that is required to reduce the index to zero, or saturation. The inputs for KBDI are weather station latitude, mean annual precipitation, maximum dry bulb temperature, and the last 24 hours of rainfall. Reduction in drought occurs only when rainfall exceeds 5mm (0.20 inch) (called net rainfall). The Duff Moisture Code (DMC) is a numerical rating of the average moisture content of loosely compacted organic layers of moderate depth. The code indicates the depth that fire will burn in moderate duff layers and medium size woody material. Duff layers take longer than surface fuels to dry out but weather conditions over the past couple of weeks will significantly affect the DMC. The system applies a time lag of 12 days to calculate the DMC. A DMC rating of more than 30 is dry, and above 40 indicates that intensive burning will occur in the duff and medium fuels. Burning off operations should not be carried out when the DMC rating is above 40. The FWI System evaluates fuel moisture content and relative fire behavior using past and present weather effects on ground level fuels. The moisture codes reflect the net effects of daily moisture gains and losses. The three behavior indices are relative to the fuel moisture content. They indicate what a fire is likely to do. The lower the moisture content, the higher the Fuel Moisture Codes, and the higher the Fire Behavior Indices-and the more active the fire will be. The Drought Code (DC) is a numerical rating of the moisture content of deep, compact, organic layers. It is a useful indicator of seasonal drought and shows the likelihood of fire involving the deep duff layers and large logs. A long period of dry weather (the system uses 52 days) is needed to dry out these fuels and affect the Drought Code. 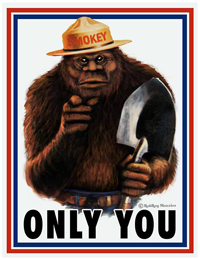 A DC rating of 200 is high, and 300 or more is extreme indicating that fire will involve deep sub-surface and heavy fuels. Burning off should not be permitted when the DC rating is above 300. The Scrub Fire Danger Code (SFDC) is based on predicted generated "fire intensity (kw/m²)" in flammable scrub type vegetation (tea tree, broom, gorse, manuka). This code denotes how difficult it would be to control a fire in this vegetation type should one start. The FWI further refined into indices that represent the Fire Intensity likely in the three vegatation types (Forest, Scrub, & Grasses). These three codes are divided into five fire danger classes (Low, Moderate, High, Very high, & Extreme) and calculate the fire intensity in kilowatts per square meter (kw/m2). The Grass Fire Danger Code (GFDC) is based on predicted generated "fire intensity (kw/m²)" in grass type vegetation (dry grass, tussock). This code denotes how difficult it would be to control a fire in this vegetation type should one start. The Angstrom Index (Angstrom) is used primarily in Sweden, it uses the air temperature and relative humidity to calculate a numerical index of fire danger. That number is the equated to the Fire Danger severity of either Extreme, Very High, High, Moderate, or Low. It's based solely on weather conditions, with no adjustment for fuel moisture. The lower the number, the higher the fire risk. The Drought Factor (DF) is a key component of the FFDI is the modelling of the dryness of the fuel. This is expressed by the Drought Factor (DF), which ranges from 0 to 10. If this is multiplied by 10 and called a percent, it gives the percentage of fine fuel that would be removed by a fire under the current conditions. The DF is based on recent rainfall and on the Byram-Keetch Drought Index (BKDI). Fuel Mositure Index (FMI) is an estimate of moisture content in available fuels, it uses the air temperature and relative humidity to calculate a numerical index of fire danger. No fire danger classification exists for this index. The lower the number, the higher the fire risk. FMI = 10 - 0.25 (T - H) where H = Relative Humidity as % (0-100) and T = Temperature in Degrees Celcius. Updated daily at 12:02 PM except for the CBI which is updated every 15 minutes after the initial midday reading until the peak temperature is reached. The Chandler Burning Index (CBI) uses the air temperature and relative humidity to calculate a numerical index of fire danger. That number is then equated to the Fire Danger severity of either extreme, very high, high, moderate, or low. It's based solely on weather conditions, with no adjustment for fuel moisture. Updated every 15 minutes after the initial midday reading until the peak temperature is reached. Here on the Sasquatch Station Weather site, the CBI is calculated from the current weather conditions and reflects the current calculated fire danger. The National Weather Service calculates a 30 day Chandler Burning Index based on forecasted weather conditions for the month. The monthly fire potential is represented by a modified version of the Chandler Burning Index (CBI). CBI provides a measure of the effects of average monthly temperature and humidity on fire intensity and rate of spread (not the same as NFDRS rate of spread). Both the intensity and spread components of the Index are linearly related to temperature (an increase in temperature results in a proportionately higher Index), but are exponentially related to humidity (a small decrease in humidity results in a large increase in the Index). The Chandler Burning Index has been shown to be highly correlated with monthly fire activity. The Forest Fire Danger Index (FFDI) was developed in the 1960s by CSIRO scientist A.G. McArthur to measure the degree of danger of fire in Australian forests. The index combines a record of dryness, based on rainfall and evaporation, with meteorological variables for windspeed, temperature and humidity. 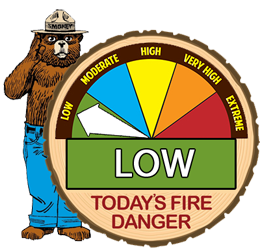 A FFDI of between 12 and 25 on the index is considered a "high" degree of danger, while a day having a danger rating of over 50 is considered an "Severe" fire danger rating. Above this level in 2010 a distinction was made between Forest and Grassland fuels. For Forest fuels, an FDI over 75 is categorised as "Extreme" and over 100 as "Catastrophic" (In Victoria the alternate rating name of "Code Red" has been adopted). For Grassland Fuels the threshold FDI values for the Extreme and Catastrophic Ratings was increased to 100 and 150 respectively. The Grassland Fire Danger Index (GFDI) is calculated from air temperature, relative humidity and wind speed. It also varies according to the greeness or curing of the pasture. It provides a figure directly related to the chances of a fire starting, its rate of spread, difficulty of control and the amount of damage it will do. The formula used here is generally for Australian conditions, but can be adapted by varying the environment variables for any part of the world.